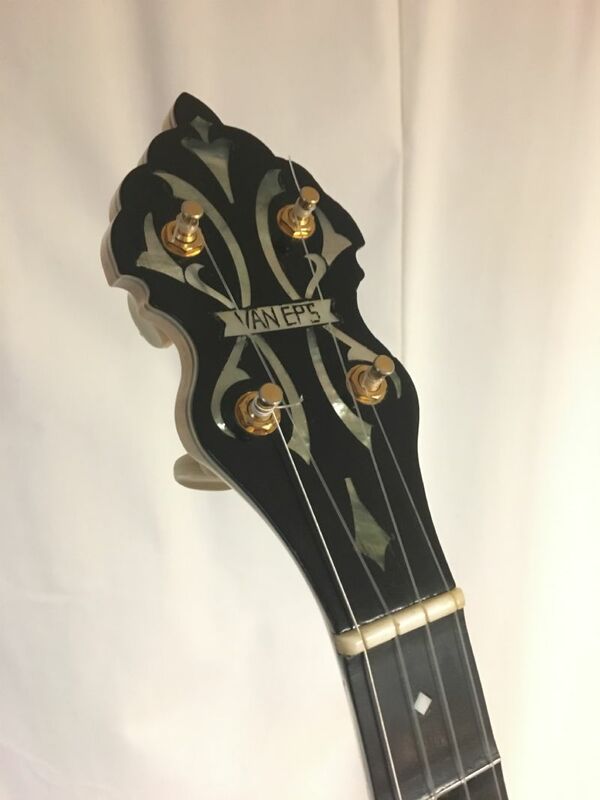 Gariepy "Van Eps Flush Fret" Banjo! This is a tandem post that I put up on the BHO but I was thinking I might post here for people who don't go there. 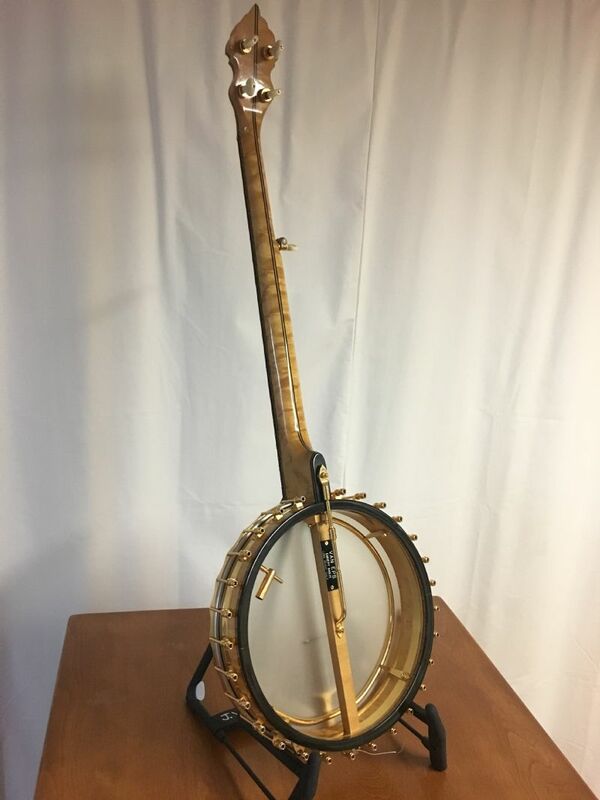 Hi folks, I recently came back from the American Banjo Fraternity Fall Rally with a new acquisition that I wanted to share. If you don't know who Fred Van Eps is, please search his name on Youtube. FVE built banjos until he died. 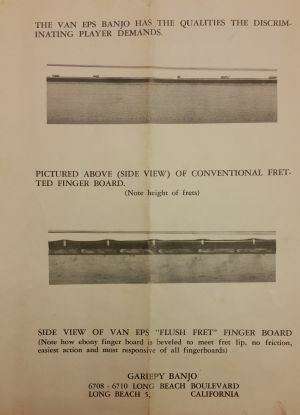 Sometime in the early 1930s he developed what he called a "flush fret" fingerboard. It was actually scalloped. These "flush Fret" banjos have become sort of legendary among "classic banjoists." They are very rare, but excellent for the style. Shortly before he died, FVE moved from Plainfield, NJ to California to live with his son Robert Van Eps. He took with him all of his banjo making tools, patterns, wood, and parts. The idea was that he and Robert were going to continue to build flush fret banjos together but at a higher volume (25 at a time, instead of the 6 at a time he usually built). Once settled, they started making parts and he taught Robert how to make banjos (FVE had written very detailed instructions as well). Then FVE died after passing a driving test. That was 1960. In the "5-Stringer" (newsletter of the ABF) issue after FVE passed, Robert announced that he intended to continue making FVE banjos. In issue #76 it was reported that Robert was hosting a rally at his house when he showed a stack of rims "shoulder high, "an unopened crate of parts," and "enough birdseye maple wood to make necks for a long time"-- all from FVE's stock. In #85 (1962) it is reported that Robert Van Eps had leased all of FVE's machinery, jigs, and all necessary equipment to ABF member Joseph Gariepy (who joined in 1961). Joseph had been previously announced as "was a friend of Fred Bacon and great admirer of his banjo playing and took lessons from him in times past." Gariepy was making his own line of "Mercury" banjos where he did all the work to make every part of the banjo except the plating (and I presume the tuners and plastic heads). He was making fully custom banjos in any length or size desired. The banjo that FVE took to rallies was also given to Joseph as a control. Joseph was moving to a larger shop to have room for all of the equipment to build the FVE banjos. 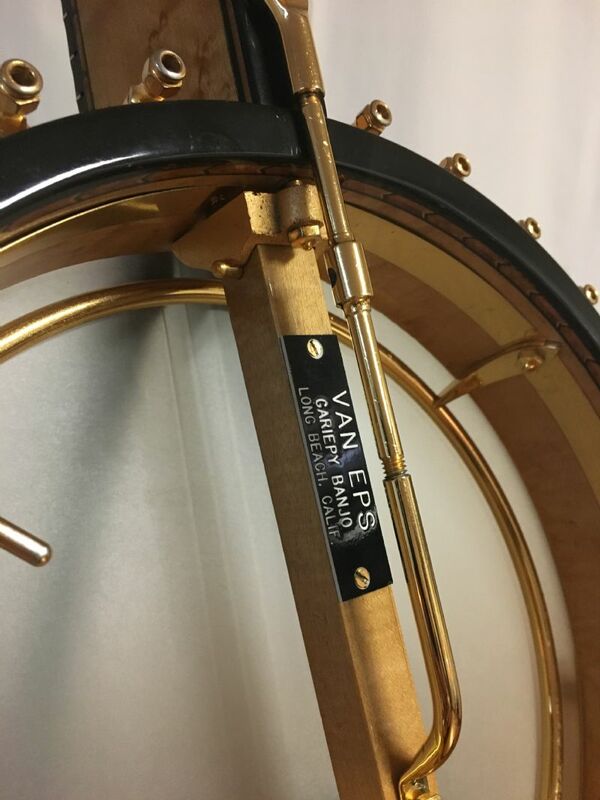 All FVE model banjos would be approved by Robert Van Eps before they were shipped. In issue #86 it was written that he had set up a new larger shop and was making FVE style wood rims. In this issue he was referred to as Joseph (Art) Gariepy. From that point on he was called Art Gariepy. 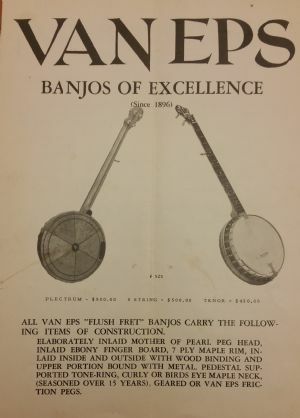 Most of the Gariepy banjos I have seen online have many features of the FVE banjos but are still very different. 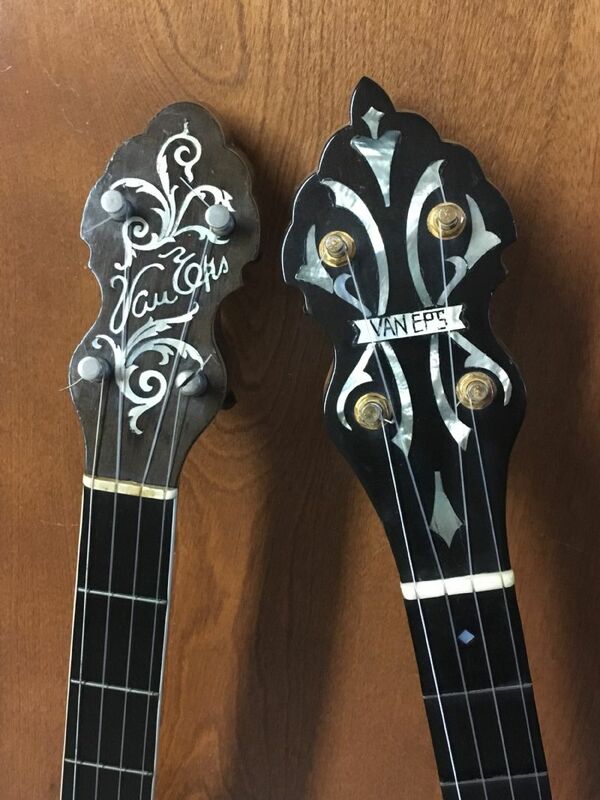 John Hoft had posted and asked about the Gariepy FVE flush fret "classical" banjos in the past. Gariepy advertised them in "Sing Out" in 1963 (the banjo pictured in the ad was a FVE make). They sold for $500! That was a lot of cash in the mid 1960s. Mine was built in 1966. He had been making them for a few years by then. By 1970 the model was not found in his catalog. (after getting a clear copy of the 1970 catalog I discovered that while not pictured or described there was a small mention that they still made FVE banjos and to write for details). I am quite pleased to have acquired one. I only know of one other (currently owned by an ABF member). I also know that one person ordered one and paid in advanced (Gariepy offered free gold plating for advanced payment in full) and never got it. It would be cool to find out if there are more around. Mine differs from a true FVE in a several ways. First, the Gariepy has a 27" scale. FVE used a 28.5" scale. The peghead shape is what is found on other Gariepy banjos. The rim has less marquetry binding than FVE used. 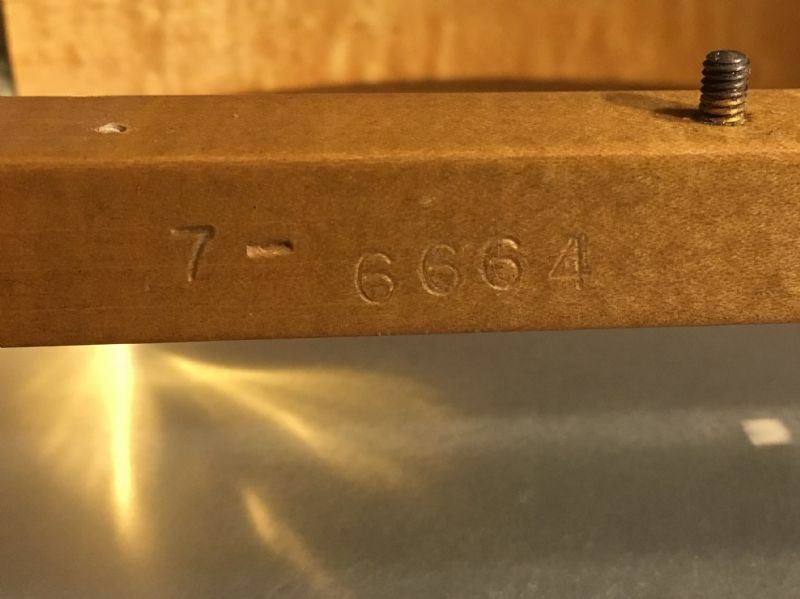 Gariepy used a truss rod (accessed through a pearl cover at the 19th position) FVE used no truss rods. The positions are marked differently than FVE used (10th instead of 9th, etc.). 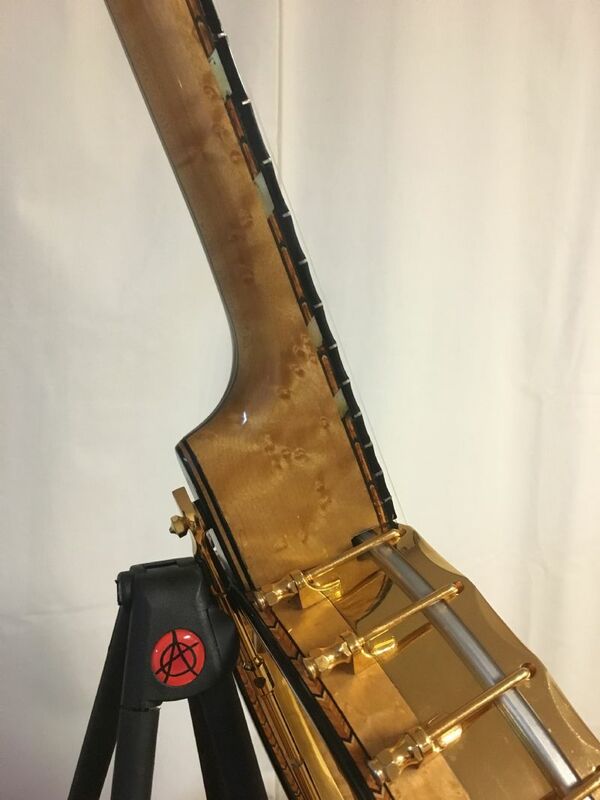 The tailpiece is made of brass (FVE used aluminum). The Gariepy tailpiece excluded the "no knot" feature (nylon strings had been in use since just after WW2). This version has geared pegs (FVE friction pegs were an option). FVE used friction pegs having a large string barrel with a split down the middle. 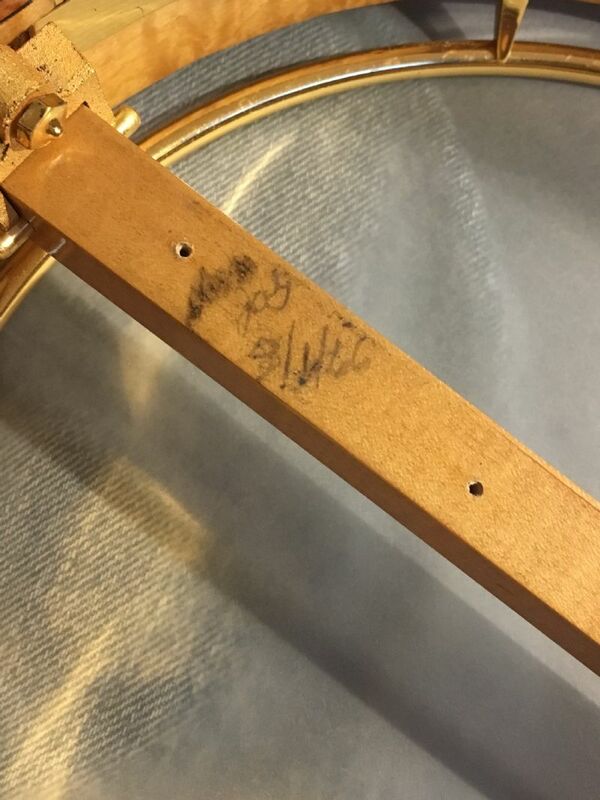 In combination with the large "no knot" lugs on the tailpiece he was able to replace a broken gut string quickly. There are stories about how he would keep first strings on the floor in front of him when on stage. When he would break a string the piano player would vamp while FVE put on a new string. Once tuned up they would pick up right where they left off. 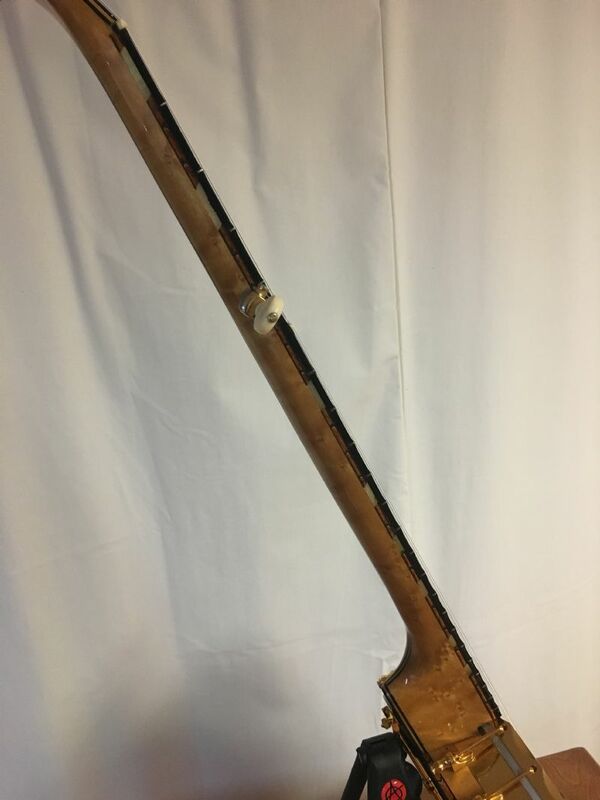 The neck is 5 pieces (FVE used three most of the time). Comparing it to other FVE banjos, the wood is clearly from the same stock. Most of the parts are identical to what FVE used too. How does it play? 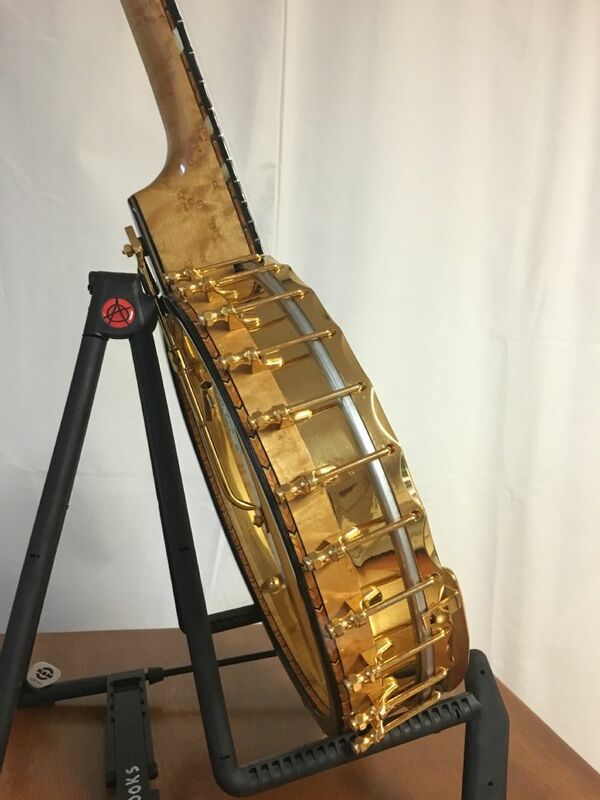 It is a fantastic banjo-- the fingerboard is amazing. 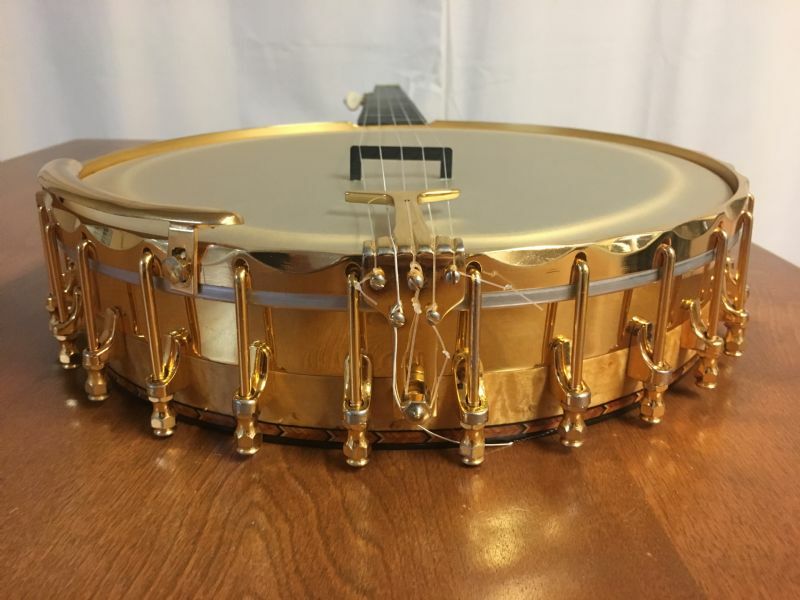 You can't beat a bit of bling and that banjo has it in buckets full. I can't wait to hear it. Thanks Ian! It is not a "real" FVE but it is pretty darn close. Thanks Joel... Just love that bass! Hey Ian, what is funny is the fact that in the case there was a "first right of refusal" note from the first owner to the second owner giving the second owner first dibs to buy. 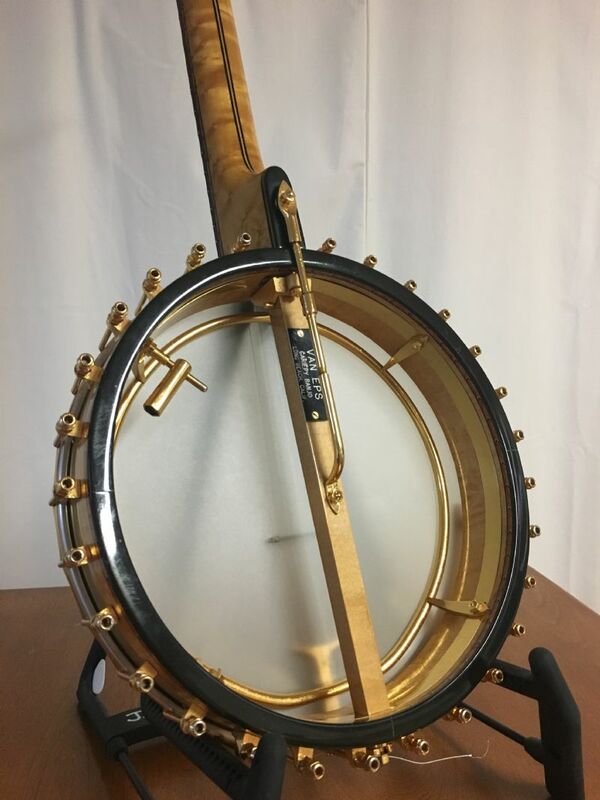 As much as I like this banjo I am pretty sure it won't be for sale any time soon. 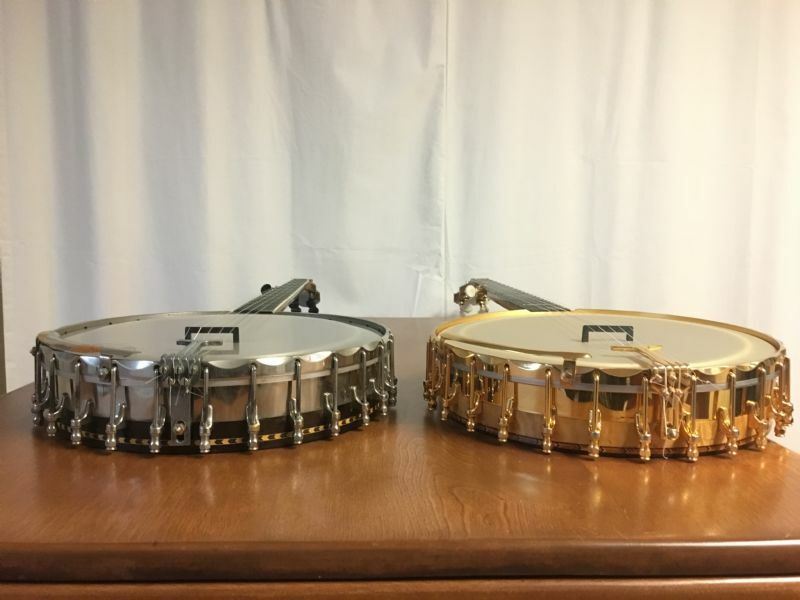 Banjos tend to not leave when I get them lately (it helps that I have the best wife who enables that behavior by talking me out of selling stuff!). ZOWIE! Congratulations, Joel. And as your banjos continue rise in upscale Zowie-ness your playing skill rises in proportion. 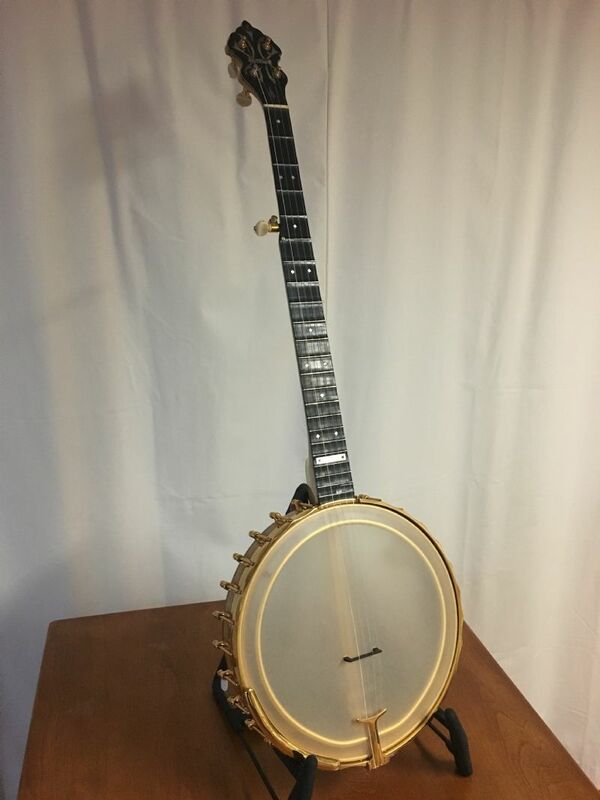 The verve with which you played DD on your BB indicates this banjo has arrived where it belongs. 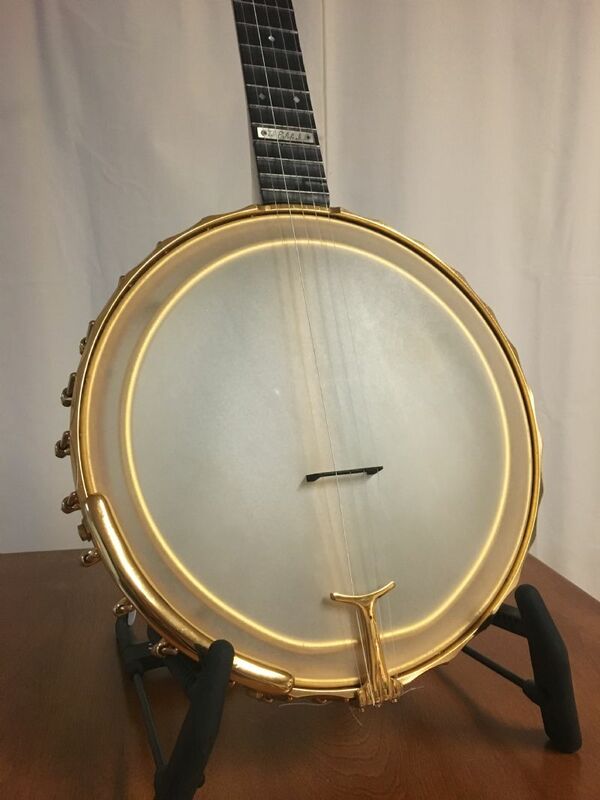 I'm late to this one, but have to say that is one gorgeous banjo. Sounds as good as it looks, and you are playing the heck out of it, Joel. Wow!